Why Select Desert Dream Realty to Represent You when Selling your Home in Cave Creek, Carefree, Scottsdale, New River, Phoenix and other Maricopa County, AZ cities. Selling your home can be a complex process. 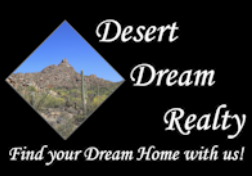 Desert Dream Realty has seasoned listing agents to help you with the entire home selling process. We will help you get the best price for your home and help sell it in the fastest possible time frame. Utilize technology including our web site and social media to showcase your property to other real estate agents along with potential home buyers.